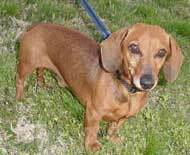 The independent and intelligent Dachshund can be smooth-haired, long-haired or wire-haired. While all three are close in disposition, the smooth may seek out a single family member as its “best friend”, the long-hairs can be more clownish, and the wire-haired is the sportsman. Low grooming requirements, with the long and wire-haired requiring more frequent brushing. All have little body oder. A great family dog good with children, however a miniature may not be able to handle younger children. The Dachshund can have “back” problems (especially as they get older), so children (and others) need to be cautioned about rough play and handling. Because of the breeds “job” (hunter) they love to burrow, and in the house you will often find them under bedding or clothing. Smooth, Longhair, Wirehaired Moderate Excellent city dog, and a good “first-time” dog. Little body oder. Can be a barker and digger. Need to be watchful for spinal problems.